Our engineers often travel to clients to provide startup assistance and staff training. Today we have a long list of countries were we supply and startup various equipment. And now this list includes a new country the Dominican Republic. It would seem nothing special, but this is the first sale to that country. There is one more country in Central America from which we have received a positive experience, thanks to the INPROCA. INPROCA started operations in 2003 and comes from the need of integral services in the area of consulting and predictive maintenance of electrical systems in facilities of the Dominican Republic. Today INPROCA teamed up with GlobeCore. 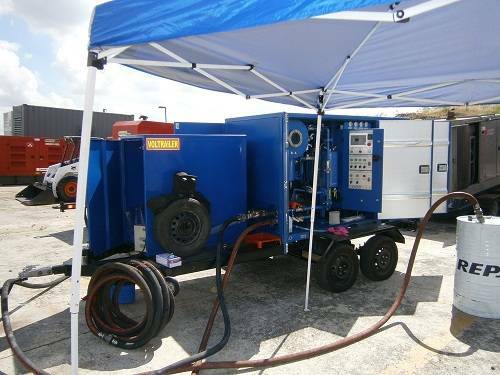 GlobeCore currently manufactures equipment, such as transformer oil purification and regeneration plants, bitumen emulsion plants, fuel blending systems etc. Specially for this client we are created a new versatile system, which allows not only thermal and vacuum treatment of dielectric, but also high vacuum transformer evacuation. We combined CMM 2.2 with vacuum package BV 500. The result is a completely new unit, which permit quick and easy transportation to the outdoor transformers in need of servicing. According to Hector Herrera, INPROCA’s Technical Services Chief Engineer, testing and starting equipment was successful; thanks to GlobeCore’s engineer Aleksandr Prystopiuk. INPROCA’s engineers emphasized the high quality of his work. Thanks to the great guys at INPROCA.